Mix chili peppers, garlic, ginger, oil, and tequila, soy sauce and lemon juice. Place pork in a deep dish. Add the marinade and place in the refrigerator for 6 or more hours. Take out the pork chunks from the marinade and insert them onto metal skewers, alternating between bell peppers, pineapples, and cherry tomatoes. Place marinade in a pot and cook for 8 minutes to thicken slightly. 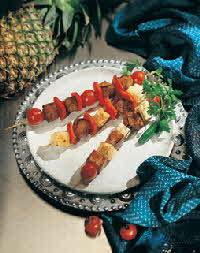 Place over the grill until golden and pour marinade over the skewers continually. A flavorful marinade for these kabobs make a tasty addition to your tailgate party.